Normally, modular multilayer flooring (MMF) feature highest quality and durable surfaces which ensure the long life of such type of flooring – professional cleaning and care corresponding to use provided. As a general rule, floating installation and especially MMF flooring types with HDF core require low-moisture cleaning methods. Which flooring has been laid? While natural, artificial stone and textile flooring mostly are clearly identifiable as such, material-related differentiation and allocation with regard to natural wood, parquet, laminate and elastic flooring is getting pretty harder. 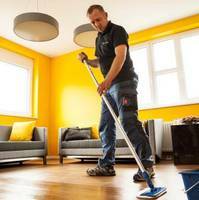 – Especially so if flooring has already been fitted and the individuals commissioned with cleaning and care do not have available supplementing information on the flooring. The European MMFA Association wants to provide necessary educational work for multilayer, modular flooring. This webguide on Cleaning and Care in the commercial sector and the MMFA Technical Bulletin TB 3 deal exclusively with the group of multilayer modular flooring (MMF) acc. to EN 16511 – in practice also termed as hybrid, multilayer, vinyl or design flooring. The legal requirements applicable in the country of purchase have always to be complied with. Note: The informationon this website and the MMFA Technical Bulletin TB 3 deal exclusively with the group of multilayer modular flooring (MMF) acc. to EN 16511 – in practice also termed as hybrid, multilayer, vinyl or design flooring. The legal requirements applicable in the country of purchase have always to be complied with. The cleaning and care recommendations for multilayer modular flooring in this Guide are based on the current state of the cleaning. The recommendations from these Care Instructions serve as additional notes on the cleaning and care recommendations of the flooring and cleaning product manufacturers organised in the MMFA. These represent non-binding guidelines and do not claim to be complete. All of the information is correct to the best of our knowledge and belief. No entitlement to warranty claims can be derived from them. The MMF flooring manufacturer/supplier has to be consulted object-related in case of doubt. Suitable cleaning agents/stain removers are available where you purchased the MMF flooring. Remember: Next tenants or other users should also know this leaflet so that they can benefit from the excellent properties and retain the value of MMF floors.